Here you can follow the blow-by-blow account of my attempt to transform myself into a (regularly) published author. Like the Anastasia Raven Fan Page! And sign up to receive the Books Leaving Footprints Newsletter. Comes out occasionally. No spam. No list swapping. Just email me! jhyshark@gmail.com Previous gifts include a short story, a poem, and coupons. Add your name, and don't miss out! Well, I certainly can't say I was early, but I turned in the article for Your National Forests magazine. It was due by the end of the month, and I made it. It took me three tries. Having 2000 words might sound like a lot, but when one has to describe a 4400-mile trail to people who may never have heard of it, it's not very many. I wrote a whole lot of the article, read it over and decided that it was so boring I wouldn't even finish it if I saw it in print. Then I tried to fix it. I pulled it apart and tried to insert some better pieces. No better. However, I did like my opening. Finally, I inserted a story, and moved the drier parts nearer the end. That was better. Of course I had to include info about the National Forests, and the trail goes through 10 of them! Anyway, it's done and sent. Writing often means re-writing and re-writing and struggling over pace and wording to make factual information more interesting. Hopefully, I've succeeded. Went out for a hike again today to check out another section of the Adventure Loop. I think I've found a good route from Black Lake to the North Country Trail. Wrote it up the the guidebook draft. This evening I gave my program, "The North Country Trail and the Kitchen Sink," at the Annual Fish and Game Dinner of the Dwight Lydell chapter of the Izaak Walton League. It was well-received, but the group was smaller than they expected. I'm posing with Fred Eyer (treasurer) and Georgia Donovan (president). It's one of those pictures that doesn't really say much, but at least we are all smiling. I sold one book. I was hoping for two, but for the size of the group, even one is good, particularly since this group's primary focus is fishing, not hiking. I've been trying to apply the theory to my life that you shouldn't ever leave a program without making a contact to book another one. Didn't succeed in pulling that off tonight, but Georgia is a live wire- she might recommend me to someone else. One big problem is that my good printer died over a month ago. I hooked up my old printer, to limp along, but I'm out of business cards, and program flyers. Other things that require quality printing are low too, but I still don't have the cash to replace the good printer. It's a problem! Nothing completed to report, but I'm working on the article that I need to have done by the end of the month for Your National Forests magazine. Tonight was the twice-a-month meeting of the local writer's group, the "West Side Gang." I've been going long enough to be no longer exactly a newbie. Most of the people brought poems tonight. There was one prose vignette, and Ellen had a chapter from her novella. Nine writers came, and seven of us brought things to read. I took "Now Then When," the poem that popped into my head, mostly last Tuesday night. Most of the group, and particularly the facilitators are very fond of unstructured, stream of consciousness poetry. I'm not opposed to that, but I like the challenge of making words fit into the structure of a meter and form and still have it be meaningful and readable without being "sing song." However, "Now Then When" is less structured than most of my poems, and it was well-received. I think it needs a couple of tweaks yet: there are two parts that don't work as well with the theme and symbolism, for me, as I want them to. I'm hopeful that there will be a call for more poems for the Elements of Life anthology, and if so, I plan to submit this. (from Twin Trinity Media). Finished and turned in my Get Off the Couch column for April. The title is "Not Just Any Old Sand Dune"
Where in the Great Lakes region can you find seven concurrent miles of undeveloped public beach? Let’s see... there is the combined length of the Ludington State Park, Nordhouse Dunes, and the Lake Michigan Recreation Area. There is the... can’t think of anywhere else? That’s because there isn’t another such place. Our local resources are unique and of outstanding quality. Although this column is seldom difficult to write, I'm always glad when I get another one successfully turned in. These columns are not available on-line, unless you subscribe to the Ludington Daily News. One collection of columns is currently available as an e-book, called Get Off the Couch with Joan, at Smashwords. Last night I stayed up late and more or less finished the poem "Now Then When." I think it needs a couple of tweaks, but it's pretty close. Not all of writing is putting words on paper. My monthly newspaper column, "Get Off the Couch," is due Monday. 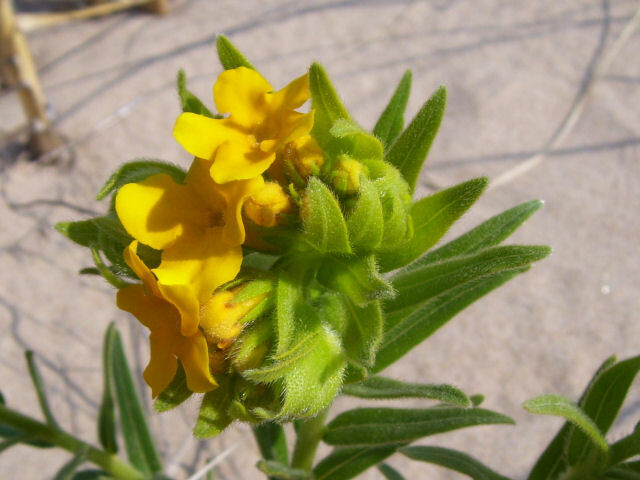 I know what I plan to write about: the history of the Nordhouse Dunes Wilderness. But I can't do that out of my head, cold. I know enough to have a casual conversation with a friend, but certainly not enough to commit words to paper with details and expectations of authority. So I talked with a National Forest ranger on Wednesday, and got some literature, and some personal observations. Next project, to find pictures I knew I had taken of a beautiful and slightly unusual plant that grows there, the Hairy Pucccon. Took me two hours, but I finally located them. This is all part of writing! As I'm trying to get more involved with the local writing group; this is the second installment of "Story on Stage" that I've attended. The idea is that there are three stories selected by Michigan writers. Those stories are then read by local thespians. In between the stories are songs performed by local artists. This is the third such event presented by Ludington Visiting Writers. The stories were "My First Cake Was a Failure" by Andy Mozina, and read by Elliot Plummer; "Beach Glass" by Deborah Ann Percy, and read by Lisa Enos; and "What We Don't Know" by Phillip Sterling, read by Chris Plummer. There was quite a good turnout, which is encouraging for the arts in Ludington. I have mixed feelings about the event. I've now heard six stories in this venue, and they are all the same tone, which is not my favorite. They were all depressing and open-ended; the "life is a sad enigma" sort of story. I'm not sure if that's the only kind of stories that do well right now, or if the selections are a function of the fact that the person who chooses them likes this kind best. So, I'm caught between wanting to be involved and not really enjoying the stories all that much. But, all three authors were there, and there was an open question and answer session at the end. They all said that they really enjoyed hearing someone else interpret their stories. I would have posted that picture, but it wasn't in focus. Bummer. Last night at the Open Mic gathering someone said, "It's so relaxing to compose poems in your head as you are falling asleep..."
"What?" I squawked. "It doesn't work that way for me. If I get a poem going in my head it wakes me right up and I can't stop pounding on it." So, of course, last night, I got a poem started in my head. It's called "Now Then When." I have two stanzas done, but it has to have four or five. The Ludington Visiting Writers hosts an open mic poetry night once a month at a nice coffeehouse in Ludington. The theory is that it will be once a month, but I guess it doesn't happen quite that often. At any rate, this was my first time to attend. It was such a small group that we didn't even use the mic, but just sat around a table. Four people read poems that they had written, myself included. There were a number of different styles, which made it fun. I read a "cautionary tale," in the classic style, entitled "Helen, Who Annoyed Her Siblings and Learned a Nature Lesson." I suspect the crummy weather kept some folks away, and Ellen had a cold, so she didn't come. This networking stuff is hard work for me. I'd rather hide out. Dave Burdett of New Author Review says, "There are a lot of good authors out there who never realize any amount of success at all, because they think their book will sell itself…..the bad news is that it will get lost in the sea of millions of books." He's been aggressively marketing his new book, "The Map." While doing this, he has decided to help other under-known authors promote their works. I'm very happy to announce that he's chosen to feature North Country Cache as the book of the week. Just sold the second e-copy of "Devotions for Hikers." This is a small booklet with ten Christian devotions based on hiking and trail themes. I've sold quite a few in print, and decided to offer it as an e-book last fall. I entered the world of e-publishing in the fall, and I have no idea what would be considered a good sales rate. There have been 173 views of the free portion of the booklet, and two sales. That's a 1% conversion rate. Good? Bad? I have no clue. I came across this great article today. It's by John Kremer, who claims to be an expert on book publishing and marketing. I've been subscribing to his tips for several months, and I think there are always good ideas in them. Some, I should do; others don't fit well; but it's always great to have a poke in the brain for another possible way to market a book. Some ways in which people have helped me are part of his list. I would love it if more of the people who say they really enjoyed my book would actually do one of them! Did some more hiking today- mostly for pleasure, but it was another section that will be part of the adventure loop, so I made notes for the guide. Got them transcribed before I forgot what all the hastily made scratchings actually meant! 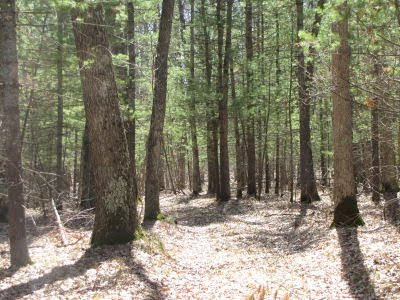 I will be writing an article about the North Country Trail for the Summer issue of Your National Forests magazine. This all happened because one of the North Country Trail staff members noticed articles about two other National Scenic Trails in previous issues, and asked them if they wanted an article about the NCT. They said yes, and the staff member put them in touch with me. I asked if this was "for free" or if there was remuneration involved. The result is going to be quite satisfactory. It's due by the end of the month, so I need to get working on it- a substantial 2000- 2400 words. The NCT goes through ten National Forests, so there is plenty to talk about! I had planned to hike a short distance with two guys today who came up from Ohio and Indiana to do some hiking on the North Country Trail. What I didn't know was how far I would be hiking with them. So, what with one thing and another, it ended up being a total of eight miles, and it took most of the day. The distance was fine, but now I'm behind on quite a few other tasks I need to get done. The really good news is that each of them bought a copy of North Country Cache. Hooray, hooray! For a niche book, such as NCC, sales from personal contacts is the best form of marketing. Many people think that it's just going to be a boring account of day after day walking along, where I camped, what I ate. But when they spend a little bit of time with me, they begin to get the idea that my writing might be more interesting than that. Tonight was the twice-monthly meeting of the West Side Gang, the local writers' support group. It was a good turnout tonight with a total of 11 people. That's the most that have ever come since I've been attending (admittedly not very long). The idea is that we bring some writing to share, read it aloud, and the others offer friendly (and hopefully helpful) critique. Not everyone brings something every time, but that's OK too. I've been reading chapters of News from Dead Mule Swamp. I managed to get one more written before tonight. That's a total of eight, so far. With this kind of support group, I might even finish this little project. We heard several poems, an essay prompted by a picture, a portion of a semi-factual historical novella, some pages from another mystery in progress, and my two chapters. Next Tuesday, the group is hosting an "open mic" night at a local coffeehouse. I said I would read a poem. Tom guffawed. "Ma’am, I can tell you don’t know Cherry Hill any too well. Ain’t you that lady what bought the place over in Dead Mule Swamp?" He went right on, not needing an answer from me. The question was apparently rhetorical. "You got to call Jerry at home. Everyone knows that." Books Leaving Footprints has been added to the Michigan Authors list at Ludington Visiting Writers. So much of this authoring game is marketing, that any time there is an opportunity for another link, another contact, etc, it's great. Wow- I got another Amazon order for North Country Cache before I had mailed the last one. This allows me to send 2 copies in one box, which will save me a tiny bit of money. Several orders a month would be an awesome trend, and Amazon would probably order 2 copies at a time if this becomes the norm. I'm not holding my breath, but it's nice to dream. 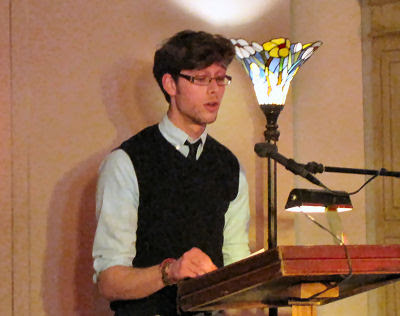 Last night I went to the Ludington Visiting Writers poetry reading. 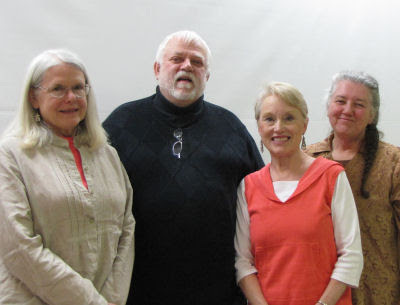 Four local poets read selections from poetry booklets (chapbooks) which have also been published under the umbrella of Ludington Visiting Writers. From left to right they are Betsy Rosenow, Jim Stewart, Jeanie Mortensen, and Vondalee Knoll. There were actually more people there than I expected. Each poet read for about ten minutes, and there were light refreshments. The booklets were for sale. Jim's book is "Our Lady of the Morels," and the three other poets are featured in a book named "Three True Voices." If I am going to try to do this writing thing, I need to be spending time with writers, so this is part of my program! Possible Inclusion in "Unsent Letters"
I received this email this morning: "Thank you for your submission to Unsent Letters! I realize your submission is now a year old, but the project was put on hold and we are now working through submissions again. Your letter has been selected to move past the first round of evaluation and is set to be considered for an offer." This would be very cool! This project exists as a blog, but the best entries are being published as a book. My letter is not on the blog, but if you want to see what it's all about go to Unsent Letters. Writers can always use bits of good news! Tonight I'm going to a poetry reading of the local writer's group. Today was another beautiful day! I went hunting for one missing piece of information for the Adventure Loop. I needed to check out a canoe-in campsite. But I was pretty sure that I knew how to get to it on foot, but hadn't had a chance to find out if my suspicion was correct. It was, and now I've seen the site without needing to rent a canoe. I have added a description of the site to the guidebook. I have to say that my experiences with distributors hasn't been very good. North Country Cache has been listed with two of them. However, I got a certified letter from Partners today that it is "in our best interest to terminate our agreement with your company." I have to say that the feeling is mutual. Here's the story. Ever since I've been peddling NCC around to bookstores, I am often asked what distributors I work with, and if the store was in the upper Midwest they usually asked about Partners. I kept dragging my feet, because it was just one more pile of paperwork, and I appreciated the independent stores that would deal with me directly. Finally, summer of 2009, I got things going with Partners. They took four cases of books! I was pretty psyched about that. Well, in November of 2010, a big box of books came back to me that had been returned to them from bookstores. They were all too damaged for me to sell. I called and complained. Just a couple of weeks ago another 1 1/2 cases came back. Thankfully, one case was unopened, ever, so those are fine. The rest are, again, too damaged for me to sell. I called and had a long conversation with their service rep. She said that they have to take returns from stores, and admitted that stores aren't careful with the books. The current status of my books was that they have about one case still out in stores, and one more on hand. So far, I've received $152, and she estimated that I have another $88 coming. This is not very much money for all of that shuffling around of heavy books. (read shipping costs). So... should I have kept a low profile, and not complained? Would that have kept me under the radar so that I'd still be listed in their distribution? Who knows. I do know that having over 1/4 of the stock returned too damaged to sell is too high of a rate for me to live with. I was also not happy with their monthly reports, which were impossible to understand, so I never really knew if they were selling books or not. Perhaps it's for the best. 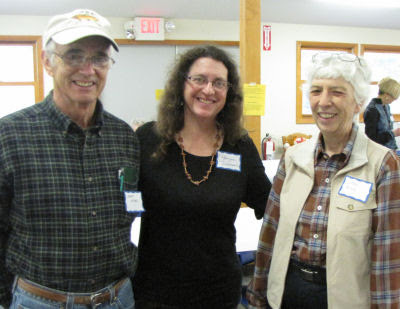 North Country Cache sells best at programs I give and through personal contacts, anyway. NCC reached a nice milestone for a self-published books in 2010. I have now sold over 1000 copies! One of the types of writing I do is content for Shared Reviews. They accept product reviews and also articles of almost any type. I've been writing for them for over two years, and am happier with them than any other online content site. I've got enough content, and high enough rank, that I'm making over $50 a month there. Today, I added a review of software that will help you catalog your home library. It would also work for any small organization that wanted to track a small library of materials. Got another order from Amazon today for ONE book. It's really annoying that they will only order one at a time. Here's how Amazon breaks down for me- it's terrible for small distributors. I have to pay the shipping, which for media mail is currently $2.77, not counting mailing materials, time, gas to go to the P.O. etc. But... it's a credibility thing. Today, I wrote chapter 7 of my mystery in progress, News from Dead Mule Swamp. 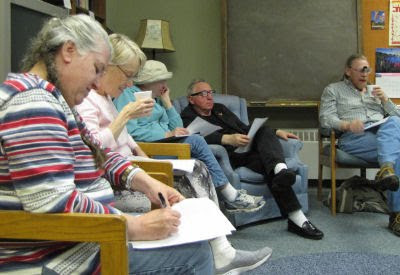 It was a short one, and I'm hopeful of completing one more before the next meeting of the "West Side Gang," the local writers' group where we share our recent efforts. I thought the next meeting was this coming Tuesday, but I actually have one more week, so there's good hope for chapter 8. In the distance I could hear the faint shrill of a siren. It rose in pitch and volume, and began to drown out the morning sounds of a sleepy swamp. I only hoped that Kyle had reached Sherri’s house ahead of that piercing wail. Have I piqued your interest? Today I did more research for the Adventure Loop. This is the best part- going outside and exploring. The results can be seen at Ellen and Joan Sneak in an Adventure. Research is an important part of writing. If this guide isn't accurate it won't be worth anything at all. I had an "alpha version" prepared, and Ellen used it to guide us along the route, since she had never walked any of it before. A few tweaks are needed, but it was mostly accurate and understandable. Horray! I spent all afternoon working on the guidebook. I had tapes from an exploring trip that I needed to listen to and transpose into written information. It took a long time. Seems like too long. Writing guidebooks for non-existent trails is a challenge. But I feel as if made progress. Today was a day that I had to be outside. I explored another little piece of what I hope will become a recognized 80-mile loop trail. (See Cooper Creek.) When I came home, I worked at getting this new information incorporated into the barely-begun guide. It wasn't a huge amount of writing, but I'm too often eager to do the hiking, and not the recording of the information, so it was a success. An author interview on "A Cup of Coffee and a Good Book"
Interview on Michigan Writers on the Air from Interlochen Public Radio. Click the picture and you can read one chapter for free! and Sep 2010, short story: "The Third Person"
Dec 2010, short story: "Gratitude"